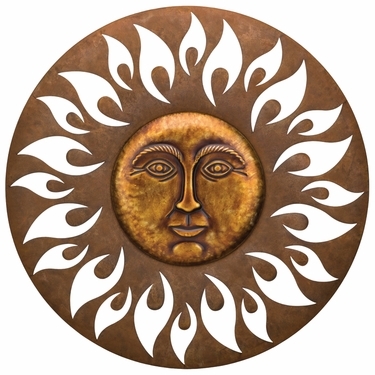 Bring your wall to life with our attractive Aurora Sun Wall Decor. In the center is an affable face accented with curvy etched solar rays. Made of crafted metal to show the textures of the rays and facial dimensions, while the gorgeous copper paint brilliantly shines. Weather-resistant and can be displayed indoors or outdoors. Size: 29" Diameter, 4.5 lbs.